belle âme Day Spa & Salon is the vision of Lisa Huston. She opened the spa after leaving a stressful job in the information technology management field. Her body was feeling the effects from the stress, and she began going to massage therapy to ease the pain. The results far outweighed the benefits she received from standard medical treatments. Huston knew she wanted to help others relieve their pain and live healthier lives, so she opened belle âme, which means “beautiful soul”. The skilled professionals at the spa use organic, natural products to help both women and men to relax, destress, and feel pampered. A variety of massages are offered, each with its own special benefits. Chair Massage helps to eliminate tension in the neck, arms, back and shoulders. A special chair is used where the face rests in a cradle. The therapist will use Swedish massage techniques, such as kneading and compression. Swedish Massage is a relaxing massage that increases oxygen flow and releases toxins from muscles. The massage is done with long flowing strokes in the direction of the heart, kneading, and circular motions. A Deep Tissue Massage is more intense, focusing on deep layers of muscle and connective tissue. This technique is used for people with painful muscles, posture problems or those recovering from an injury. For people that exercise often, a Sports Massage may be the best therapy. It helps to loosen muscles and increase flexibility. With Hot Stone Therapy, smooth stones are heated and placed on shoulders and back muscles to increase circulation and loosen muscles. Hot Stone massages help people with muscle tension in their backs. In addition to different types of massage therapy, body wraps, manicures, pedicures, facials, and other services, the spa offers pulsed electromagnetic field (“PEMF”) treatments. The medical device produces unique frequencies that are used to regenerate cells. This technology is proven to help reduce stress, relieve sleep problems, help with focus and concentration, promote blood flow and circulation, improve cardiac function and increase nutrient and oxygen supply to cells. 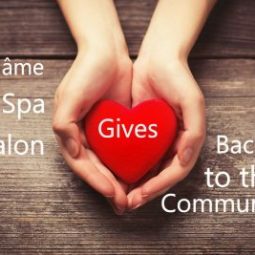 As a way of giving back to the community, belle âme is offering a special for charitable groups. Local charitable organizations who schedule an event with 8 or more people, will receive 50% of the proceeds. Other special programs include “Girls Night Out”. The next event will be held on July 22, from 4-9 pm. Wine and hors d’oeuvre will be served, and spa services will be offered at a reduced rate. It will be a fun and relaxing night of pampering.